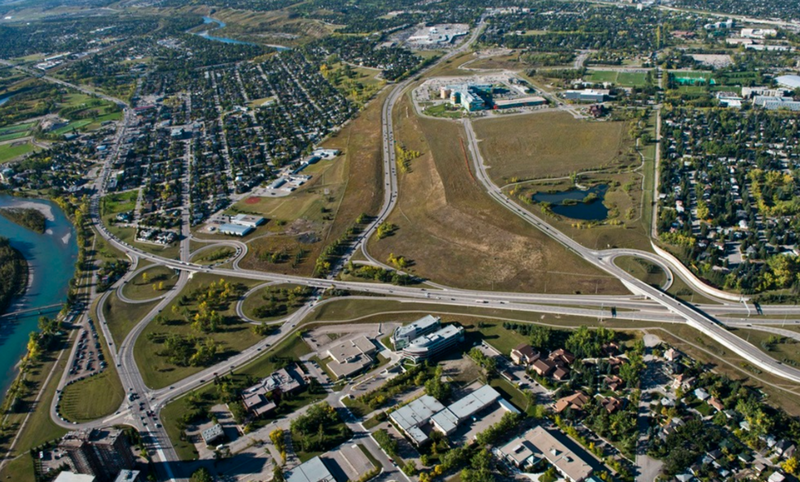 It is amazing how successful James Robertson, CEO and President West Campus Development Trust has been quarterbacking the development of University District (vacant land west of University of Calgary, next to Alberta Children’s Hospital) community in the midst of a major economic downturn. It is impressive how he has developed a game plan totally different from East Village and Currie, Calgary’s other inner-city, master-planned urban villages. Early concept rendering of pedestrian streetscape. He has completed “passes” to several condo developers for touchdowns, early in the game, just like East Village and Currie. But he has thrown touchdown passes much earlier in the game with the players like Save On Foods (grocery store), Brenda Strafford Foundation’s Cambridge Manor (seniors housing) and most recently, the ALT Hotel. How he convinced Save On Foods to be part of the first quarter of the game is remarkable. Usually, a grocery store wants to see a critical mass of residents before they commit. Given University District is only minutes (by car) from three Safeway stores (Market Mall, Montgomery and Brentwood) and a Calgary Co-op (Brentwood), this was a long bomb completion. Construction has begun of the 38,000 square foot Save On Foods as part of a mixed 288-unit residential development. The building - to include a coffee shop, restaurant, pet store and wine merchant - will be the anchor for University District’s main street. 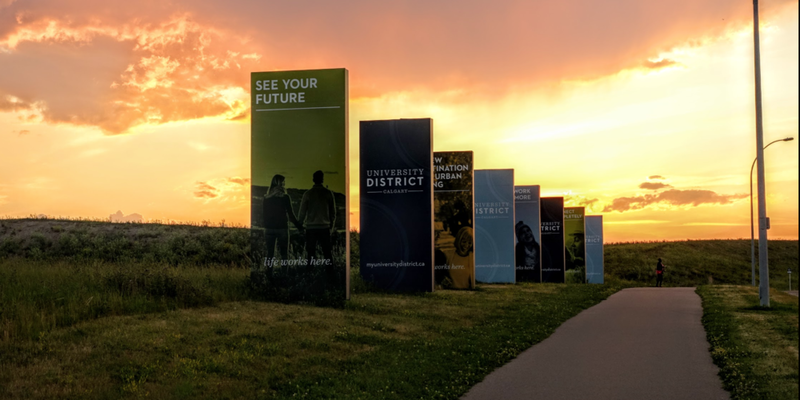 It is scheduled to open in 2020 at approximately the same time as many of the University District’s first residents move into their homes. In comparison, residents in East Village had to wait several years before they got their grocery store and to get their own retail/restaurant, while Currie residents are still waiting. Save On Foods residential development concept rendering. Currently under construction. While most master-planned urban villages start with mid to high-end condos as a means of creating a market for signing-up the retail, shopping and services players. University District committed to housing for seniors (not known to be big spenders) at the outset. Construction of Cambridge Manor, a 240-unit assisted and long-term seniors’ care facility has begun. It is set to also open in 2020. Developed by the West Campus Development Trust in partnership with Brenda Strafford Foundation, the goal is to engage the entire University of Calgary campus in a multi-disciplinary approach to aging in place. How innovative and mindful is that? By design, Noble (by Truman Homes) and Ivy (by Brookfield Residential), University District’s first two residential projects include larger townhomes as a means of attracting families to live and stay living in the district as their families “grow and shrink.” Robertson has heard and responded to the criticism that Calgary’s inner city condo development lacks larger units more suitable to the needs of families. Concept rendering for Alt Hotel / Residential development under construction. While the game isn’t over yet, Robertson and his team are off to a fast start. Note: An edited version of this blog appeared in the May edition of Condo Living Magazine. West District: A model mid-rise community! Currie: Calgary's newest historic district?